Samosas… Chicken Fingers.. Oh my! Following the long weekend where I indulged in hamburgers, hot dogs, pizza and potato chips I’d glad to say that for most of the week I ate fairly well. I had some minor slips up such as more potato chips and a couple spring rolls and a bag of baked Lay’s. Those slip ups took place from Tuesday – Thursday. Not huge slip ups, on Wednesday I had 2 small spring rolls, but still a slip up. Baked Lay’s? 130 calories for the entire bag, but still 24g of carbs that I didn’t need. But in comparison, today’s slip ups were slightly bigger. At lunch time I had 2 veggie samosas and for supper I had 4 chicken fingers (no dip). Now that might not seem so bad considering that my snacks have all been on the healthy side (almonds, cottage cheese w/ fruit, dark chocolate) but I still feel very guilty about it. Good news is that I’m back on the Insanity workouts. Completed Day 1 today and it was tough but felt good. I’m just hoping my knees aren’t throbbing tomorrow. If I can get focused on Insanity I know that I will be more focused on my healthy eating. I keep reminding myself that I did Insanity for almost 2 months and stayed on a healthy eating plan. The progress pictures prove the hard work and I know I’m more capable of doing it again. Still lacking are a set of fitness goals. I had my measurements done and I recall setting goals in terms of body fat percentage, but those goals aren’t displayed anywhere and I’ve completely lost sight of them. I need a goal board, something I can post and look at. It’s Sunday night and honesty i ate way too much this weekend. on top of unhealthy eating i haven’t worked out in 3 days. So i feel like I’ve taken a step backwards in my progress. Tonight I’ve had enough and it’s time to get serious. I know I’ve talked about goals before but I’m done with the lack of progress. Tomorrow is a new day and a new start. Time to track my meals and workouts. Good night! Time to get serious and just so it. Banana chocolate chip muffin and today i had a sausage breakfast sandwich (oh and i had an egg mcmuffin yesterday too) then i also ate a bowl of chips tonight and a few spoonfuls of fried rice. But it’s not like i would eat my regular meals in addition to the junk food. trying to get focused and organized with my healthy eating. I don’t think I’m losing weight but rather maintaining which is ok. What’s great about my first two months of progress is now knowing that i can do it. I can get focused and stay motivated and now i just need to get back there. I was’t successful with bodyrock.tv so that’s still something to try. to flip the tray liner over at McDonald’s, see the list of nutritional information for all the McDonald’s items and read that the Breakfast Burrito I just ate had 300 calories and 16g of fat. Woah! I really didn’t think it would have 16g of fat, but then again there are morsels of pork sausage and good amount of cheese. Was it worth it? Not really? I know that I could have made breakfast at home and my own version of a breakfast burrito. 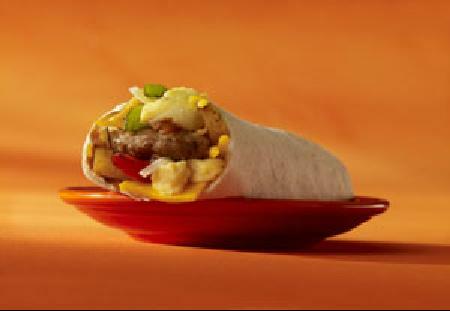 I’d make it with a whole wheat tortilla with egg whites and turkey sausage, peppers, onions and low-fat cheese. That’s definitely on the breakfast menu for next weekend, that and whole wheat pancakes for the kids. We spent most of the morning and afternoon out and about, we went grocery shopping and then stopped by the mall. The kids wanted to eat at the mall food court and so we decided we would, it was either food court or Costco. I struggled with deciding on something to eat. After the breakfast burrito, I really didn’t want to indulge in a food court meal and then realize that I ate 1000 calories that I really didn’t need to. But I did end up eating 1/2 an Arby Q sandwich. It was way too salty to me so I could only eat half of it. I should have gotten the plain roast beef sandwich instead. Oh and I ate 3 pieces of sushi – california roll. I also snacked on some Kernel’s butter salt popcorn. Looking at the nutritional information online, 5.5 cups of butter salt popcorn has 250 calories, 13g fat and 31g carbs. I think I had about 2 cups of popcorn so I’m looking at 125 calores, 6.5g fat and 15.5 carbs. It’s amazing how the little snacks and the light munching really add to your daily calorie intake. After we got home from the mall, I napped for about an hour and then worked out. Increased bench press to 75lbs (bar + 15lbs each side), which felt great. Followed up with a protein shake after the workout and 1 piece of dark chocolate w/ almonds. 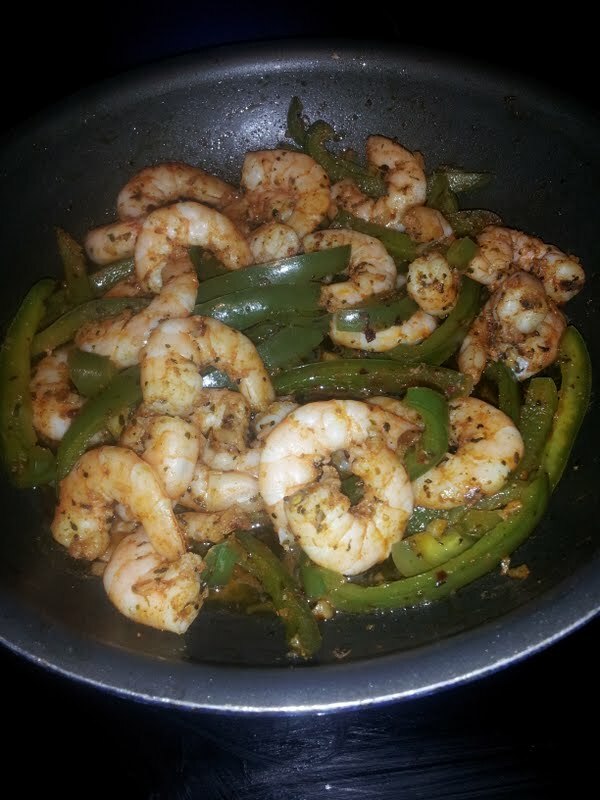 Prepared meals for tomorrow: 3 eggs (3 whites, 1 yolk) w/ spinach and cajun shrimp w/ green pepper. I definitely need to get back on track with my meals. The plan is to increase my lean protein and cut back on fruit and sugar. I finally upgraded my cellphone, from the Blackberry Bold 9700 to the Samsung Galaxy S II LTE. I had fun downloading and installing apps yesterday. I installed the MyFitness app, but I found that entering my daily food intake and exercises just took too much time. I’ll give it another week and see if I can regularly update my food/exercise diary. I’m really not one to use apps on my phone and don’t even use the more common apps like Tasks or Calendar. I’ve now got a smartphone with so many app capabilities and I should try and take advantage. I followed the photo link and it took me to BODYROCK.tv. I spent an hour last night browsing the site and watching a couple of the workout videos. It’s definitely something I want to try. The best part? They’re all workouts that you can do from home. Granted, there is some equipment that I don’t have, but the videos are great because they show you other ways to do the same exercise but without the same equipment. Currently there is a May 30-day challenge happening and a new workout video is posted daily for you to follow. I won’t be participating the 30-day challenge but will try to do the daily workouts. I’m going to do a bit more reading on BODYROCK.tv and this may become my personal May challenge/goal. If I decide to go ahead with my own version of the BodyRock challenge, I’ll post my before and after pics. Wow… it’s hard to believe that today is May 1st. Where did the last 4 months go? The past month or so, my exercise hasn’t been as intense. And I have yet to set some SMART goals regarding my fitness. Well May is going to be the month where I kick things back into high gear. Due to my knee pain, I won’t be going back to the Insanity cardio workouts, but instead this month is focused on getting stronger, lifting heavier and doing my best to eat clean and stay within my allowance of 2 cheat meals. Today was my daughter’s first mini-soccer game, and this year I volunteered to be one of two coaches for her team. So I got home from work at 4:30pm and immediately started thinking about what I needed to prepare for the game at 6pm. I knew that I had to swing by the community center to pick up the pop-up nets and I wanted to be at the field at least 10 minutes prior to the starting time, so that I could meet the parents as they arrived. So we were out of the house at 5:40pm. Out on the soccer field til 7pm. As soon as we got home, it was time to feed the kids supper. While they sat at the kitchen table, I cooked tomorrow’s meal/lunch (whole wheat pasta w/ mushrooms and green peas, tossed in a carbonara sauce). The pasta was fairly quick to prepare, so I washed the dishes and since the kids were still eating, I took the time to go ahead and peel a few grapefruits for this week’s snacks. Finally finished in the kitchen shortly after 8:30pm and was really thinking I’d just get the kids ready for bed and then do some work. But I knew that if I didn’t get even a small workout in, I’d feel awful tomorrow. So me and the kiddies headed downstairs and I did a quick chest and triceps workout. I’m so glad that I worked out, even though I didn’t get to do all the exercises I wanted, it felt great. And what’s even better? I was able to bench press 70lbs today!! (bar + 12.5lbs each side) That is my personal best and I’m motivated and determined to get stronger and to lift heavier. Looking forward to this month’s workouts!! Now that competition prep week and competition day are over, things are back to normal in regards to our menu plan. Of course, since DH ate a lot of steak and fish last week, we won’t be having much of that in the upcoming month. Our Sunday evening was extremely busy so I didn’t get a chance to make anything for today’s lunch. That being said, tomorrow’s lunch is beef n broccoli. Once the meat is coated in the cornstarch/water mixture, pan fry the meat in 2 tablespoons of olive oil. Fry until browned and toss in 2 medium onions (I add extra onions) and 4 pounds of broccoli florets. Mix so that the beef, broccoli and onions are all coated. 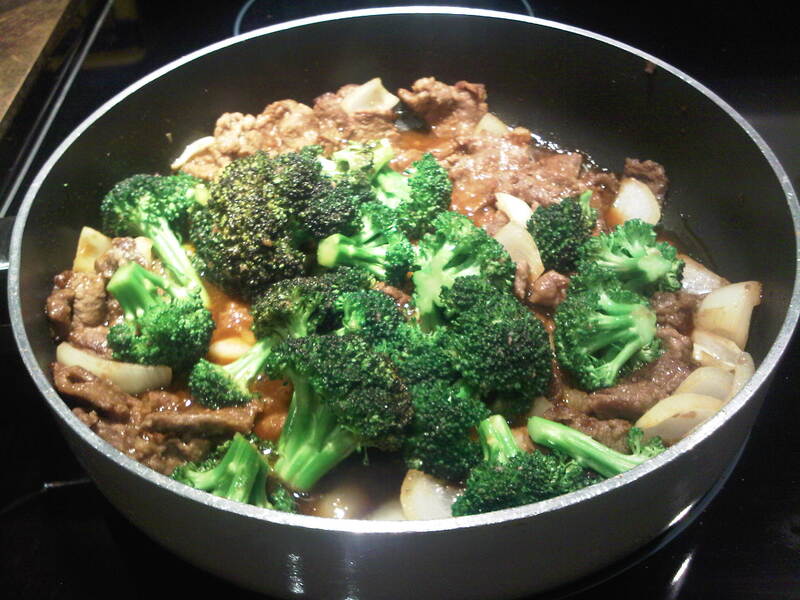 Turn off the heat and place the lid on the pan to allow the broccoli to cook without overdoing it.